EcoWindChimes.com is accepting orders for Mother’s Day of 2013. The American-made wind chimes can be engraved with a special message for mom. 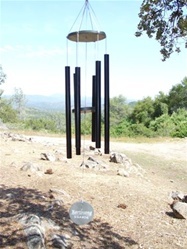 Regardless if someone’s mom is alive or not, a wind chime is a great tribute to her. EcoWindChimes.com has personal engraving options or a standard selection of a rose followed by “Happy Mother’s Day.” Any of the wind chimes sold by EcoWindChimes.com can add on an engraving option. The company also sells engraveable slate plates. “People are always seeking unique, personal gifts- especially for mom,” continued Betzen. “Why not give her something that is made in the U.S. and will last close to forever? Did I mention we now have a 365 day return policy?” Orders for Mother’s Day can be made by visiting http://www.EcoWindChimes.com.